Browse and perform recursive searches in .MDB files without Microsoft Access. 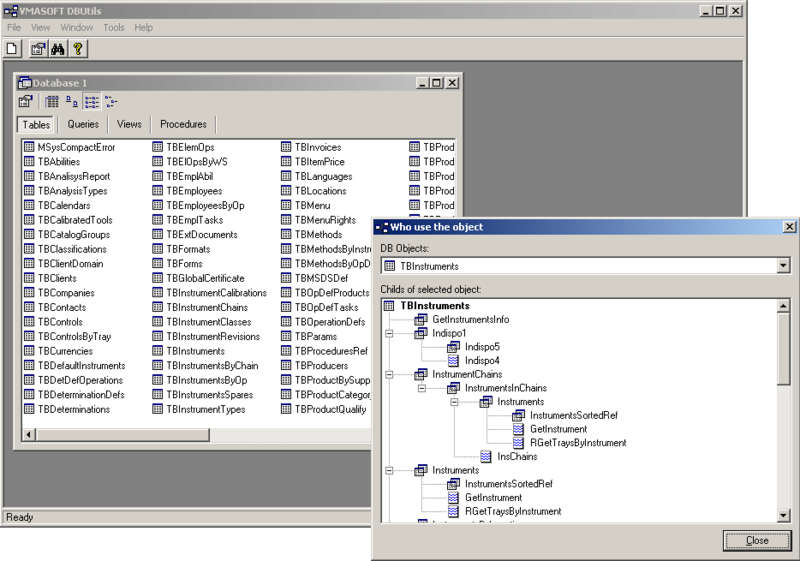 Access objects dependencies was one of the most wanted feature of Microsoft Access environment. Until releasing this tool developers spent hundreds of hours checking "by hand" the relations between objects in the process of maintaining or normalizing the database. Now, with only one click, the developers can see the hierarchical dependencies for a specific query/view, viewing the entire tree of queries and tables that are used (or use) by an object. Other important features include the ability to perform searches through database structure or to view table content. This software can also be used by persons interested in opening .MDB files without having to buy the more expensive Microsoft Access application.